If you have to obtain the internet driver from a spare computer, you can put it on a USB drive or CD, and be able to get it on to the pc you are working on. You still only want the internet driver because you want to find the rest of the drivers from the computer you’re installing them on. Sometimes, manufacture sites have utilities that can recognize what specific drivers you need. thing to do is go to the manufacture’s website and get the correct driver from there. Most of their sites you look for Support, Technical Support, Drivers, etc. Just put in your model and OS info and you will find a list of drivers for your computer. When I work on a computer that I have to find the drivers for I always burn them off so I will have them in the future. CHECK WITH THE CHIPSET MAKER’S WEBSITE. If the computer manufacture website doesn’t have the driver of the device you’re looking for, then you should check the chipset maker’s site of the device. Let’s say you know the device is an NVIDIA GeForce 220 video card and you have an HP Desktop Computer. You check it at HP website and do not find your driver. Just simply go to NVIDIA’s website and get it. WINDOWS AUTOMATIC UPDATE TO FIND DRIVERS. If you are lucky your lan or Wlan driver was put on and you can access the internet if so we can set up windows to check for drivers using automatic updates. Sometimes windows will find and put on the correct driver. Follow these steps to set up windows to find drivers (If you have internet access). Once you have a Lan Wlan drivers on you can turn on Automatic Updates and have Windows check for updated drivers. It’s important to set Windows to install and update drivers automatically. Your PC is probably already set to download updates automatically, but you should check. If you follow these steps, you might never have to install a driver yourself or struggle to get a device to work. 1. 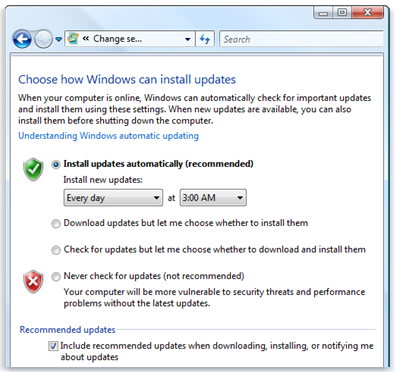 Open Windows Update by clicking the Start button , clicking All Programs, and then clicking Windows Update. 3. Click Install automatically (recommended). 4. Under Recommended updates, select the Include recommended updates when downloading, installing, or notifying me about updates check box, and then click OK. If you are prompted for an administrator password or confirmation, type the password or provide confirmation. Don’t neglect the final step, which concerns drivers. You’re not done until you select the check box to include recommended updates. If you don’t select this, Windows can't provide all the updated drivers it finds for your hardware. After you set Windows to install and update drivers automatically, you can update your drivers with Windows Update. 2. In the left pane, click Check for updates. 3. 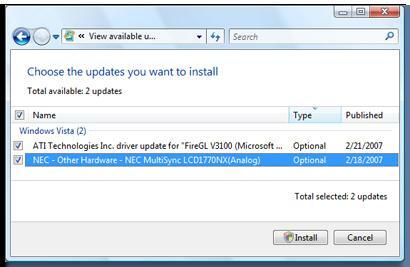 To see if updated drivers are available, click View available updates. Windows Update will list any updated drivers that are available for devices installed on your computer. 4. If updates are available, click the driver that you want to install, and then click Install. If you are prompted for an administrator password or confirmation, type the password or provide confirmation. I have included this info from Microsoft’s website. 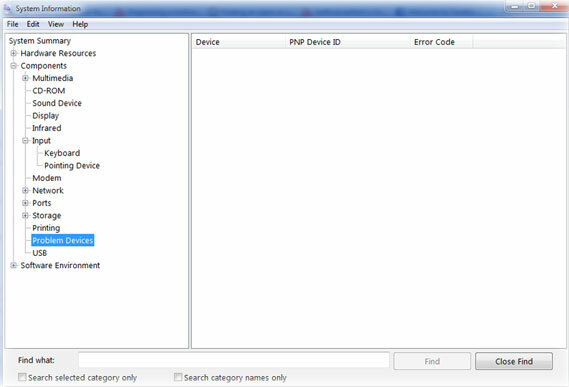 If you still can not find a Device Driver for a component in the device manager you can look it up a different way. All manufactures of devices have to include a Vendor ID and a Device ID of their Plug And Play devices. We can use this information to get the correct driver for our computer. You can boot up in safe mode or boot normal. First click Start > All Programs(Program Files)> Accessories> System Tools> and finally choose System Information. You will see a screen like this. Click Components and go down to Problem Devices. Here will be any devices that do not have a driver. PNP Device ID PCI\VEN_10DE&DEV_0A20&SUBSYS_830F1043&REV_A2\4&3527B13C&0&0010 . Pay attention to what comes after PCI. In this example VEN_10DE&DEV_0A20 will be used to find a driver for this device. When I search my device ID I find my results. 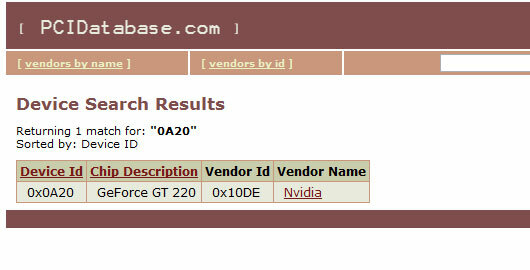 From this information I can go to Nvidia website and get the driver I need. Ok go to http://www.pcidatabase.com/ and put in your vendor ID and or the Device ID. Your search results will tell you what kind of device you have and then you can proceed to look for the driver you need as now you know the device. Just place your device id in the search and you will get a list of drivers you can download. And of course there is our best friend www.google.com simply put in your device ID and or Vendor Id in Google and you will soon find your driver. If you find out what device you have but still cannot find a driver then you can go to www.driversguide.com this site requires registration but is well worth it. If you are working with a desktop computer and are having a problem finding what that unknown device is. You can simply take out one PCI, ISA, etc. card at a time and boot to windows until you see there is NO device listed in Problem Devices. Once you determine the card that is showing up this way you can get the FCCID of the card. By law, all cards (PCB) sold has to have an FCCID number. You can use this number at www.driversguide.com to find a driver. Now after all this and you have a driver you cannot find I recommend to go to www.drivereasy.com . This software is FREE and usually will get the problem driver for the device. This software does what stated above manually .It will get the Vendor ID and Device ID and compare it to their own database of drivers. In a few cases this software has save me from not finding a working driver at all. You all so can use driversguide.com software to just simply identify the drivers you need and then go to the proper website and get them that way. It is always best to use the most recent and stable versions of your drivers that can be found from the computer manufacture’s website, or chipset maker’s website. In some cases when you cannot get drivers this way you have to use the other methods listed here to find a suitable driver for the device. Some Repair Techs will say NEVER USE ANY DRIVER UNLESS ITS FROM THE MANUFACTORS WEBSITE. This in my opinion is a great BEST PRATICES guideline. Let’s face it if someone brings you in a pc to repair and you have to give it back without a driver for device, and the PC will not function correctly then that will be a customer lost. Or if you are working on your own PC and can get the proper driver on and the PC works great then that is great. I have used lots of drivers over the years that I did not get from the manufactures website and things worked out fine. Just use common since if all the drivers are installed and you test out the pc and it is working fine then it is a success. If you work on a lot of pc and always hunting up drivers then I would download this software: http://drp.su/download.htm it is FREE and works good. It keeps all the drivers in a folder on the CD or USB drive and can put them on right from there. This is good if you do not or cannot get internet to use www.drivereasy.com or get the proper drivers from the manufactures website.